Do you know what a QR code is? Do you know what to do with one? Data suggests not. According to this infographic, just 52% of you have even heard of or seen a QR code, and only 26% have actually scanned one. I'll admit, I was part of that 74% until just last weekend. So I pulled out my iPhone, downloaded an app, and scanned this strange black-and-white square code-y thing. What's going to entice some random person scan one? C'mon. All the cool people are doing it. You're not cool if you haven't taken a picture of yourself laying horizontally, praying, or doing something so normal they use it as a stock photo in a picture frame. And how do you expect to define yourself as an individual and stand out from the masses without taking part in an organized dance in a seemingly unorganized world? Planking: an activity consisting of lying face down in an unusual or incongruous location. Tebowing: a neologism derived from Tebow's propensity for kneeling and praying—even during crucial periods of a football game. Stocking: a participatory photo fad in which people take pictures of themselves recreating scenes from stock photos. Flash Mobbing: a group of people who assemble suddenly in a public place, perform an unusual and sometimes seemingly pointless act for a brief time, then disperse, often for the purposes of entertainment, satire, or artistic expression. Now the only question is, what will the next Internet meme be? It's nothing new for developers to hide easter eggs in new technology and media. It's happened since the beginning of animated film at Disney, video games like Mario, and software like Microsoft's Windows 3.1. 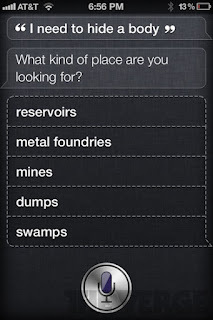 So what Apple's dev team has hidden in Siri on the new iPhone 4S shouldn't be surprising either. "Siri, where can I hide a dead body?" "Tell me a story, Siri." "Do I make your horny?" "What's the meaning of life?" "Siri, will you take a photo of me?" "Tell me a joke, Siri." I'm dead siri-us. Just give it a try and see what she says.